Diana G. Gallagher lives in Florida with her husband, Marty Burke, co-author of The Chance Factor, book #2 in the YA Star Trek: Voyager trilogy. Also in residence are two dogs, three cats and a cranky parrot. Although Diana had always wanted to be a writer, she spent several years teaching kids to ride horses and then spent a few more as a professional folk musician. When she discovered science fiction and Star Trek via Star Wars, she not only discovered what she wanted to write, but also an outlet for expression in music and art. While diligently pounding out a few million unsold words, she gained a certain notoriety among SF fans and space development advocates with her songs about humanity's future in space. While writing The Alien Dark (TSR 1990), her first published novel, Diana also tried her hand at whimsical fantasy art. What began as a means of paying convention expenses and having fun soon developed into a full-time artistic endeavor. Best known for her hand-colored prints depicting the dog-like activities of "Woof: The House Dragon", she won a Hugo for Best Fan Artist in 1988. However, when The Alien Dark finally sold, Diana decided she had to concentrate on writing. Called in to pitch to Star Trek: The Next Generation on the basis of a spec script, she turned her attention to teleplays and original screenplays for a while. Although none of these efforts resulted in sales, she became hooked on Trek and the next logical move was--books! Shortly after she reached that conclusion, Pocket Books decided to publish YA Star Trek. Not only did she sell YA DS9 #5 Arcade, but she had finally found her niche. Kids! Working with Pocket Books editor, Lisa Clancy, Diana has written thirty Intermediate Reader and Young Adult novels in several series. These include The Secret World of Alex Mack, Are You Afraid of the Dark, The Mystery Files of Shelby Woo, The Journey of Allen Strange, Sabrina the Teenage Witch, and of course, Star Trek. She is currently working on another Buffy the Vampire Slayer novel. How did you become interested in writing media tie-in books? I stumbled into writing media tie-in books through Star Trek. After pitching to The Next Generation and then submitting a writing sample and outline for an adult Star Trek book, I was contacted to submit for a new line of Star Trek books aimed at kids 10-14. Right after Arcade YA DS9 #5 was completed, Minstrel Books, a division of Simon and Schuster, began publishing books based on Nickelodeon shows. I launched the Alex Mack book series and just continued on from there. Are there special tips or requirements for this type of writing? Aside from having the usual writing skills and command of craft all writers need, the requirements for writing in someone else's universe are fairly simple. The writer must know the show: background, episode storylines, characters, etc. It's also imperative to maintain the flavor of the particular series. Depending on the show, there are plots and character activities that will or will not work for the production company. The production company approves everything and has the final word. I do PR whenever the opportunity arises, but mainly through signings at bookstores and on-line contacts. However, I once turned my garage into a Haunted Bookstore for Halloween and gave away autographed copies of my two Halloween books for "trick or treat." That was great fun, and thanks to Pocket PR, the event received local TV coverage and a write-up in Publisher's Weekly. Is there an ideal time or environment for you to work on a manuscript? If so, please describe it. Which of your books is your favorite, and why? That's a difficult question to answer. The current book is always the favorite of the moment. However, I am particularly fond The Alien Dark, my first and only (to date) original novel, Star Trek: Arcade because I'm a longtime fan of all the ST series and it launched my career as a media writer, Alex Mack: Frozen Stiff because I had to write an interesting book with the main character being frozen for half the story and succeeded, and Buffy The Vampire Slayer: Obsidian Fate (September 1999) because I love the show and thoroughly enjoyed the change of pace inherent in writing an adult novel. I read for my own enjoyment at the end of the day and tend to like thrillers, mysteries and some science fiction. My favorite authors are James P. Hogan (SF) and Stephen White, (psychological thrillers), and Tom Clancy to name a few. I also try to keep current with my fellow authors in our various series endeavors, Sabrina The Teenage Witch in particular. I've read all the Buffy novels and am grateful to Nancy Holder and Christopher Golden for their wonderful and inspiring work. What effects do you think the Internet will have on publishing in general and on the Young Adult market in particular? "Aspiring writers should put their time and effort into developing and writing an original novel, which can be submitted to all the houses that publish that particular genre, be it science fiction, romance, etc. Once published, other doors will open." This is a tough question, too. I've met several aspiring authors recently who have sold to e-pubs. I don't know if this will help or hinder their endeavors to break into print through established publishing houses. Since I like to curl up on the couch to read, I doubt e-pubs will replace bound books with paper pages. It's impossible to predict what the future will bring. However, although selling to a "regular" publisher isn't easy, I think I would still pursue that course if I was starting out now, rather than going electronic. This is in reference to novels or books -- not articles for e-mags. Because of the shorter format, I do browse through and read some e-mags. As for the YA market, I think on-line reviews and websites can increase sales of the actual printed books. Then again, kids and teens spend a lot of time in front of computers and may be more open to reading books on screen. Again, it's hard to say. How do you find plots? I "what if" a lot. For instance: what if Alex got frozen while she was morphed? I take the basic idea as the foundation and develop a story from there. Idea to brief premise to full outline to 25,000 words -- or more depending on the series. What special difficulties or advantages do you find in working with characters who are well-known and who have "real-life" actors portraying them? There are many advantages since the production company has already developed the background and characters. Half the work is already done. However, as I said above, a writer writing in such a series is limited to plots and character motives that are acceptable to the show's producers and creator. I've never found this to be a difficulty, just a necessary consideration. How does a writer break into these specialized markets? One of the problems with writing an unsolicited outline and/or manuscript for a media book series is that there's only ONE market for the work. If the project is rejected, the author has no place else to go with it. Aspiring writers should put their time and effort into developing and writing an original novel, which can be submitted to all the houses that publish that particular genre, be it science fiction, romance, etc. Once published, other doors will open. Do you have an agent or do you handle the details of publishing your books yourself? Should writers of YA manuscripts submit their work to agents first or directly to publishers? I have an agent who was instrumental in getting me into the media book market. She also keeps me posted on any new series or project that might interest me and handles all contract negotiations and any problems (few) that may arise. I work with my various editors directly as far as what books I'll be doing, beginning with bouncing basic ideas back and forth and developing the books from there. A first manuscript, whatever age group, must be complete. The new writer can submit to many agents while simultaneously submitting the book to one publisher at a time. In my case, I secured my agent while my book was being seriously considered by an editor. The manuscript was eventually turned down by that house, but she sold it elsewhere. My advice: Write, re-write, re-write again, read, submit, forget about it and go on to next project... write, re-write.... etc. Every published author was unpublished at one time. Everything is written one word at a time. What does the future hold for your writing? I'll continue writing media tie-in novels in those series I really like. I also have three original series in various stages of development which I hope to complete and sell when time permits. Do you have a website? How can readers find out more about your books? I don't have my own website, yet. However, people can check for Diana G. Gallagher at Amazon.com or at simonsays.com to find out more about my titles. Tell us about being named a Hugo Award Fan Artist. That must have been exciting! That was a thrill! I had lost the Hugo the year before by a narrow margin and was delighted to finally take one home. I believe my nomination was based on a series of humorous prints I developed with a dog-like character called Woof: The House Dragon. I distributed and sold the prints through science fiction art shows. Jan McDaniel is a writer from the southeastern United States, currently living in Georgia. 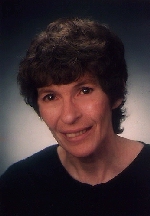 Her published work spans a twenty-five year period and includes columns and articles for newspapers and magazines, curriculum materials, resource kits, radio spots, book reviews, author interviews, and fiction in traditional and electronic publications. Within the past two years, her short stories have appeared in the Savannah Literary Journal, EWG Presents, MOONDANCE: A Celebration of Creative Women, The Literary Journal, A lternate Realities, and FrightNet Online Magazine. Her monthly columns and website reviews may be read in Haven's List Newsletter and WORD WEAVING: the essential elements and through America Online's Other Side of Creativity (Keyword: OSC).